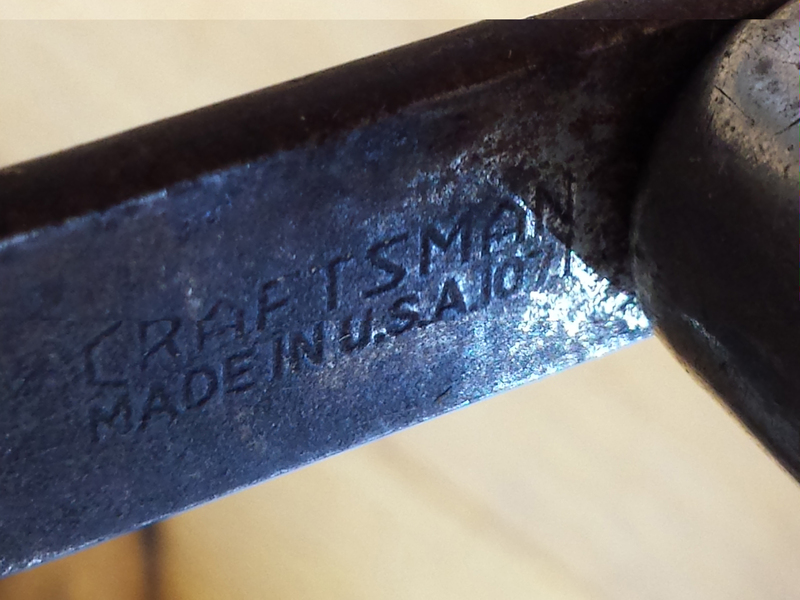 The first hand drill I restored was a Craftsman 107.1 (sometimes called a 1071, since folks can’t make out the period). This drill is a clone of the Millers Falls no. 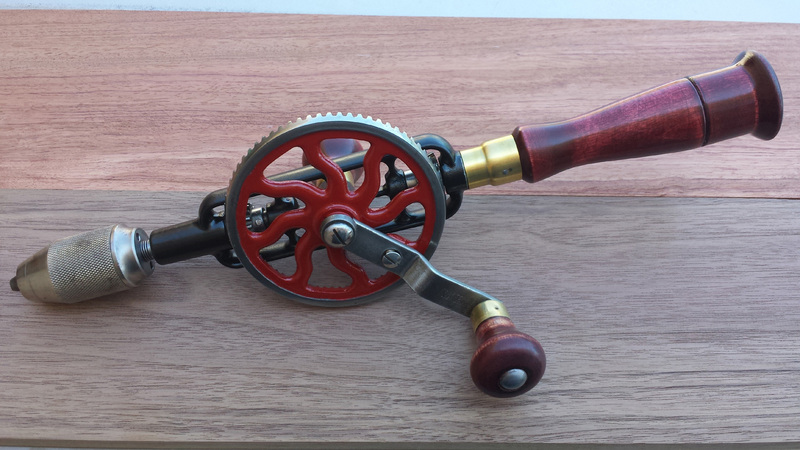 2A hand drill. Clones like this were manufactured by one maker for another brand, in this case, Millers Falls company made these to be sold under the Craftsman name. 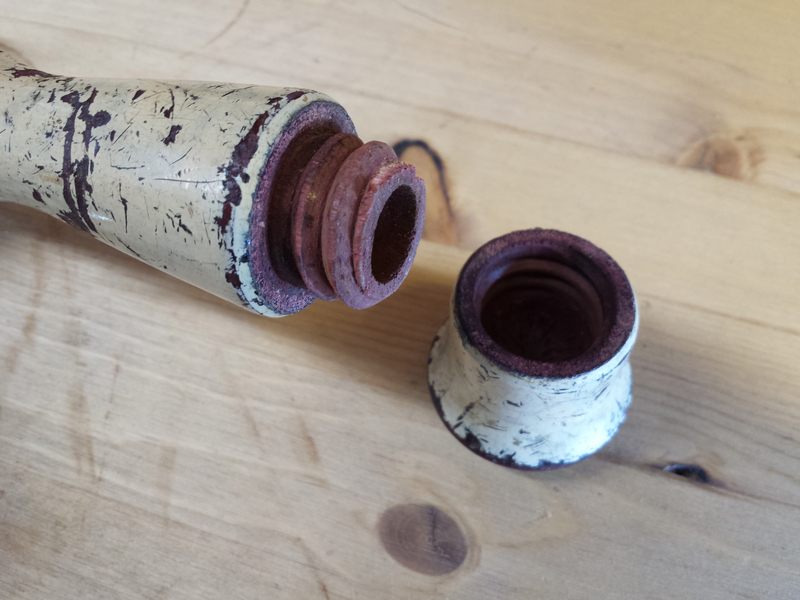 I felt a little trepidation before my first drill restoration, but I was mollified somewhat by the atrocious paint on this drill. I felt it would be difficult to screw it up much more. Regarding the paint, for a moment – I’m not sure what the story is with it. Was it an original paint job done for Craftsman? A way for MF to disguise their drill? (This might make sense, as the finish underneath the paint is standard MF red stain.) Or did some previous owner think it would look better in milk-white? I suspect it is original to the drill. 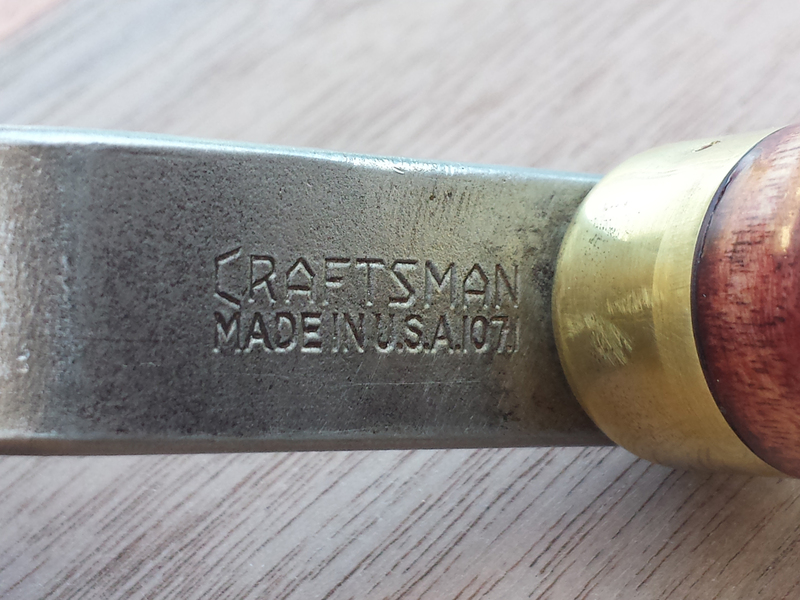 Craftsman 107.1 hand drill, as acquired. 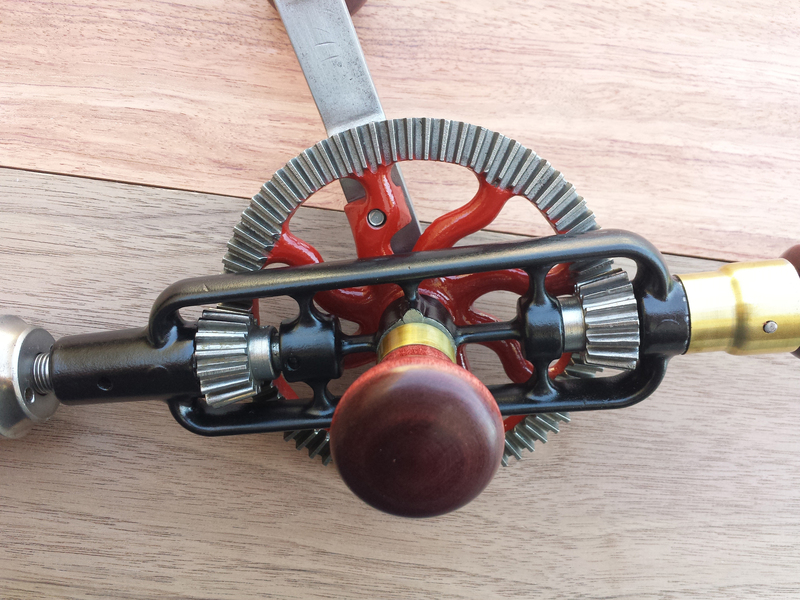 The lower gear (L) is held in place with a pin that goes through the spindle, capturing both parts within the frame. 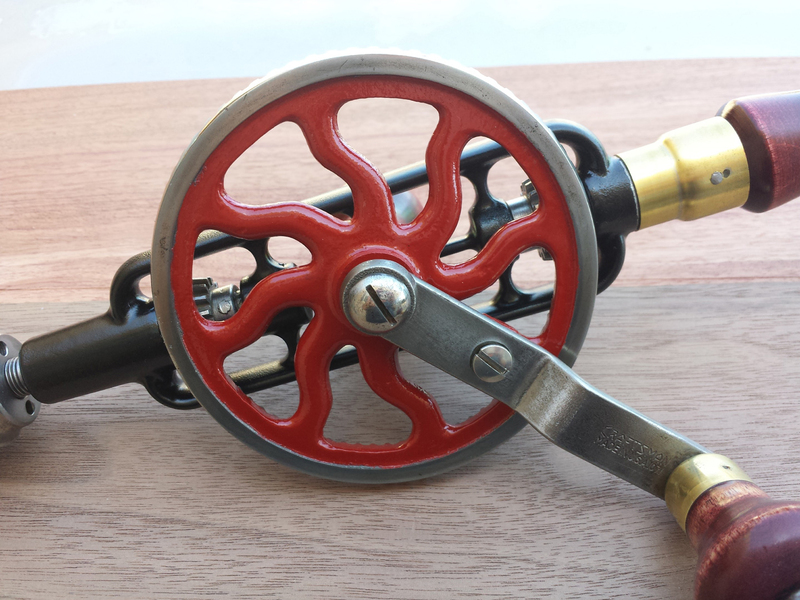 The upper gear (R) is captured on a shaft that goes up into the handle, where it is pinned in place through a threaded rod integral to the frame. 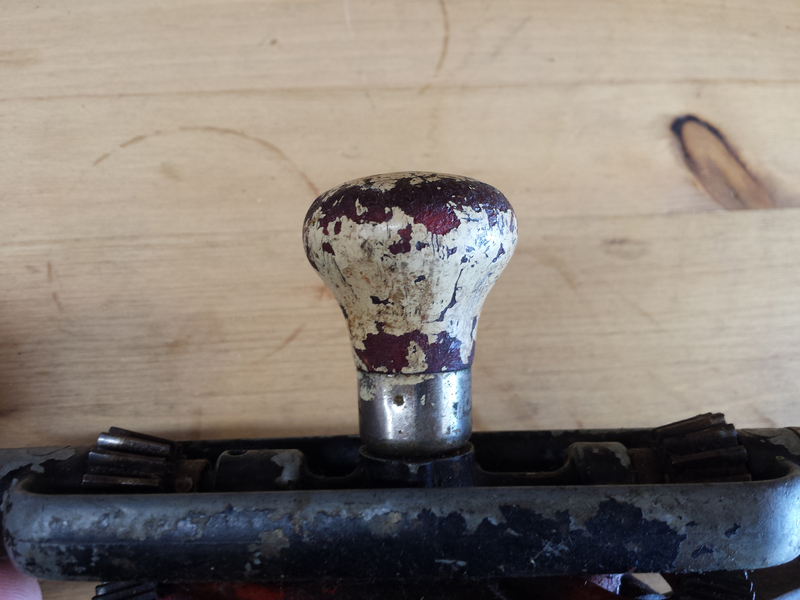 The crank handle turned freely. I don’t know if the hex headed bolt is original or not. 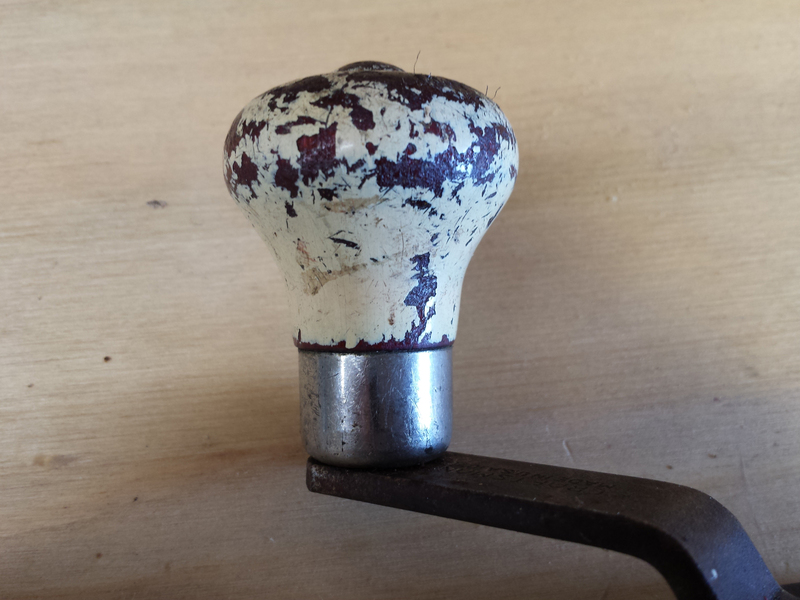 Crank knob with atrocious paint. Probably lead-based, to boot – at least that’s what I assumed. Dust masks, good ventilation, and a good wash up after sanding were my precautions. Someone was sloppy with the paint. They got some on the rivet. The handle was not cracked. Why, what is that pleasing rattle coming from inside the handle? A very nice extra was the set of original drills (or ‘contemporary’ would probably be more accurate). 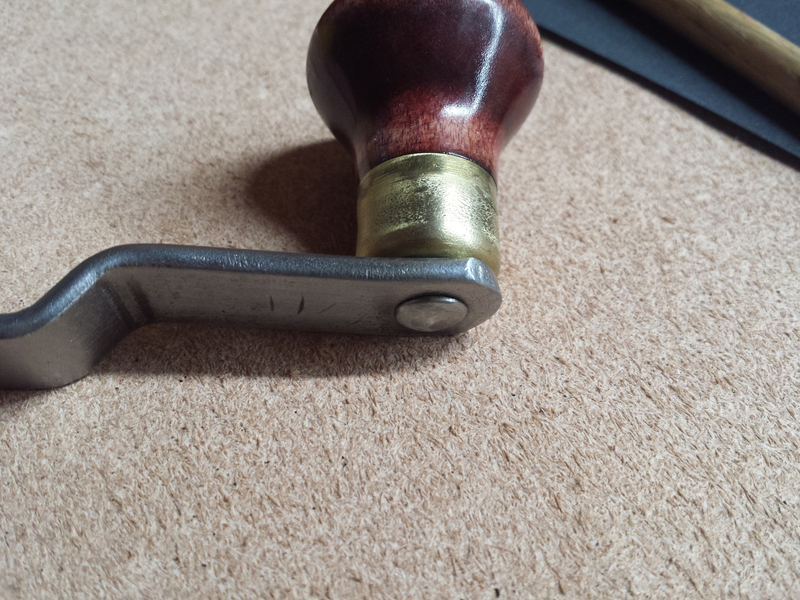 A pin holds the handle/ferrule to the frame. 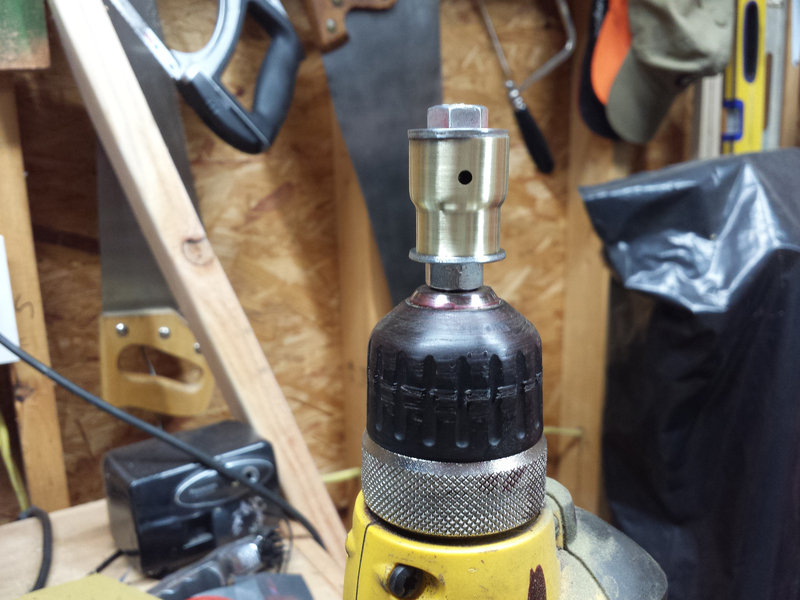 This chuck will accommodate bits from 0 to 3/8″. 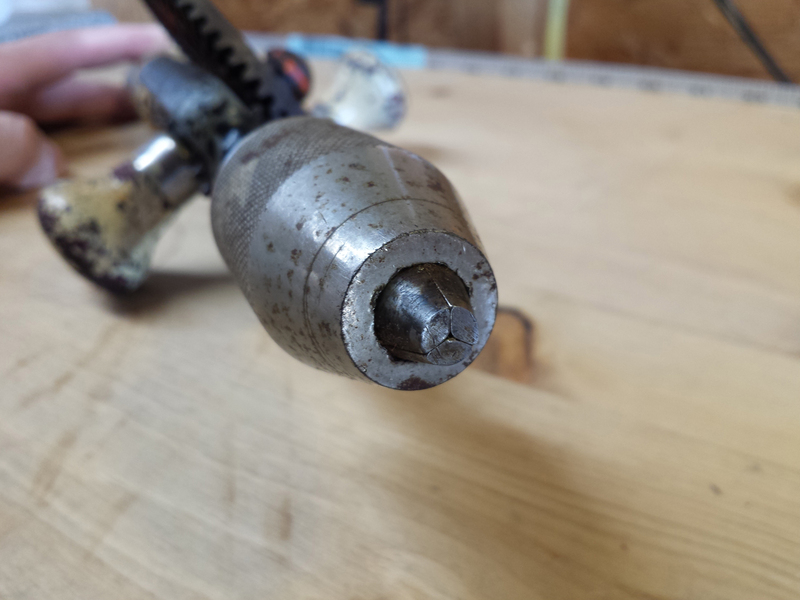 In my experience, 3/8″ is pushing it for a hand drill. 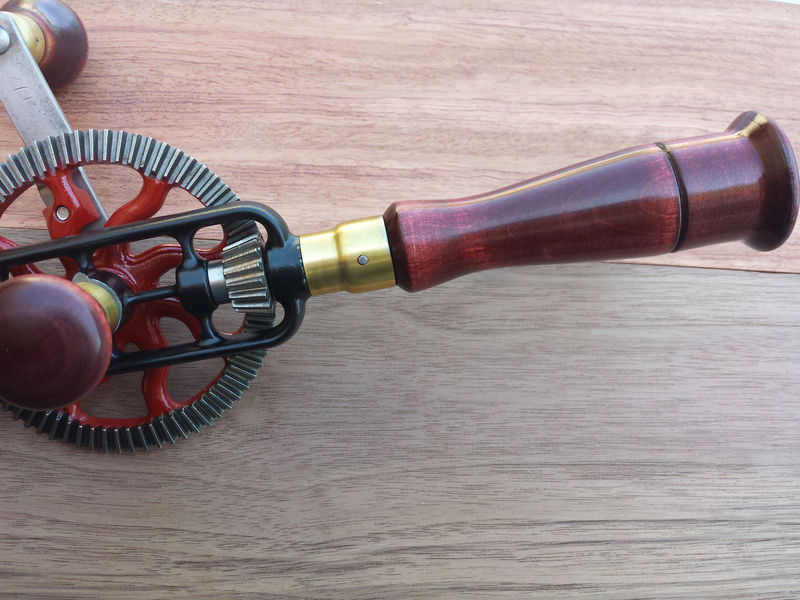 The three jaw chuck opened and closed freely and was flush when closed. The side knob is present, which is lucky. Many of these go missing, since they’re removable and some people don’t like them. The ferrule is nickel plated. Boy, what were they thinking with that paint? 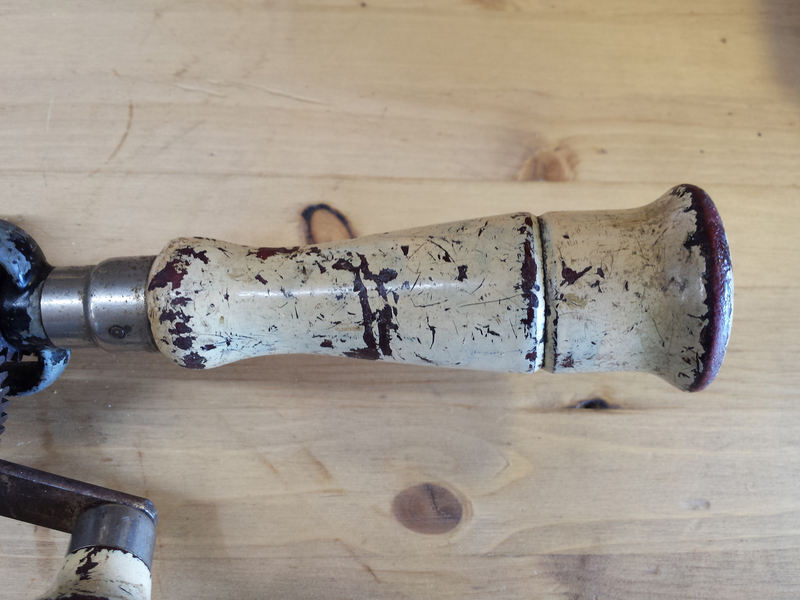 Frame, with the side knob removed. This isn’t all that dirty, just 70+ years of light rust. The wheel was a little rusty, but the paint wasn’t all that bad, actually. Notice the standard Millers Falls spoke arrangement. The wavy spokes help accommodate internal stresses in the metal after the casting cools; they serve a purpose beyond just show. 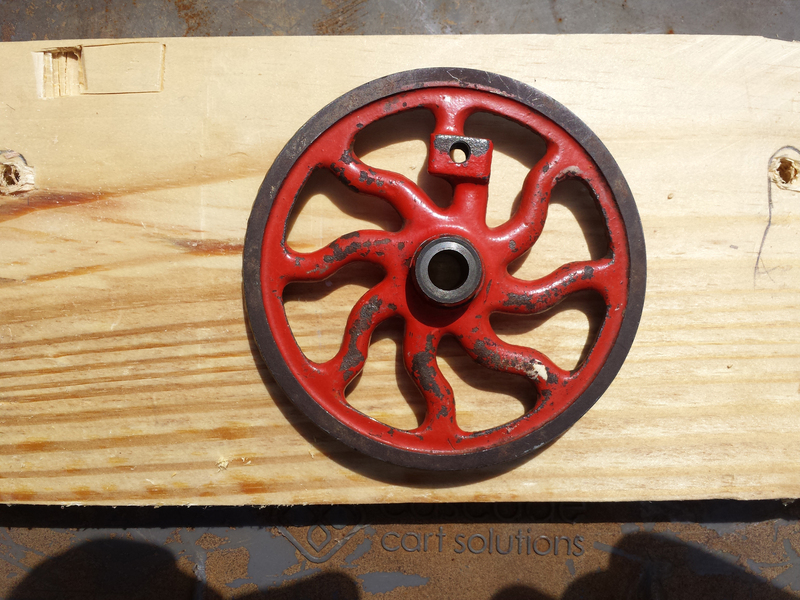 The wheel was cleaned up on a wire wheel on my bench grinder, and the spokes were sanded clean of paint. 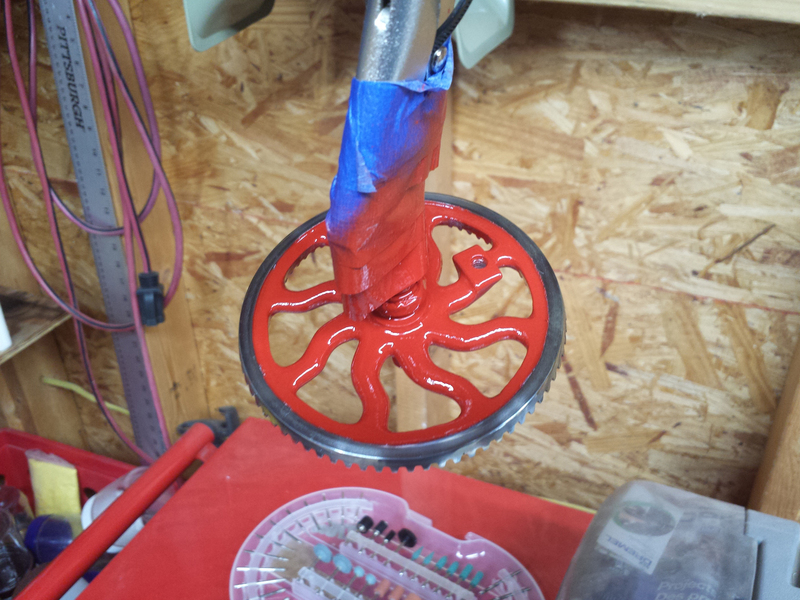 It’s easier to sand blast the spokes clean, but I didn’t have a blaster at this point. 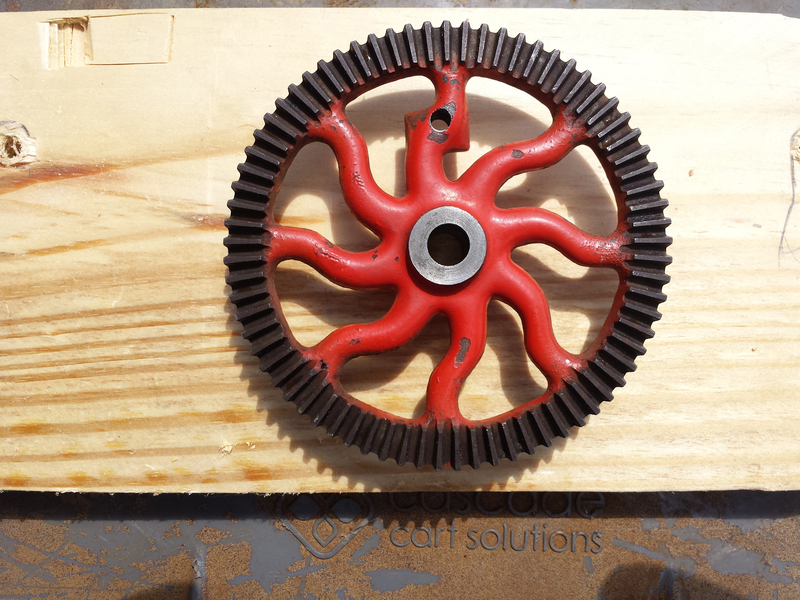 The hub, rim, and gear teeth were masked before painting. 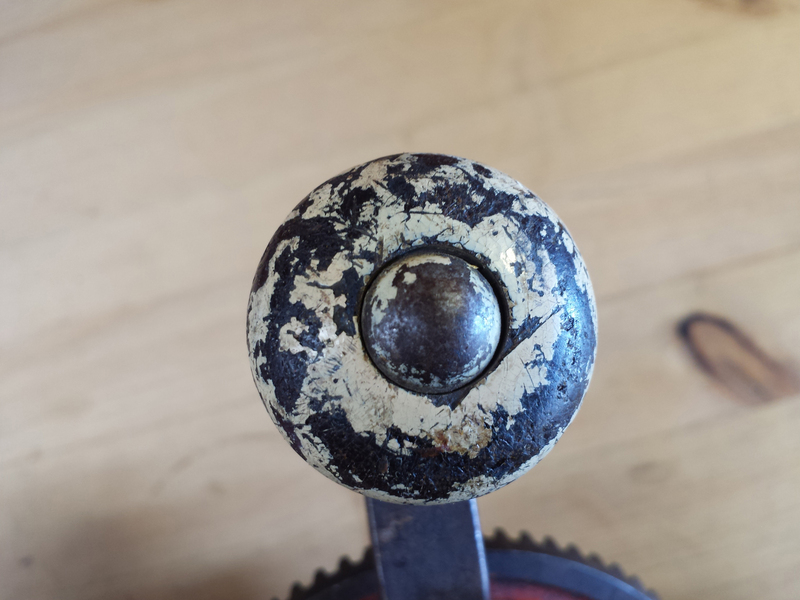 The side knob was chucked into a drill with tape to protect the threads. 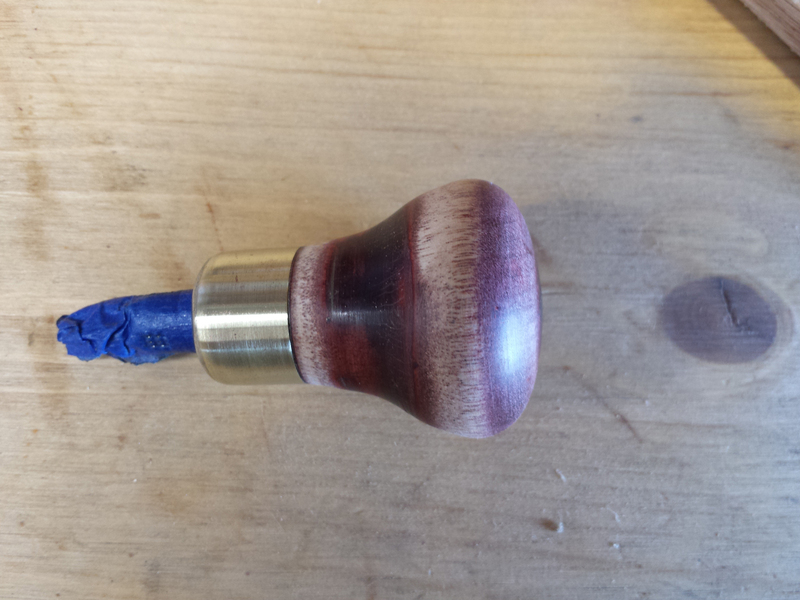 I sanded the knob and the ferrule (the nickel is very thin, revealing brass beneath). The stain is so deep, it’s impossible to remove it all. 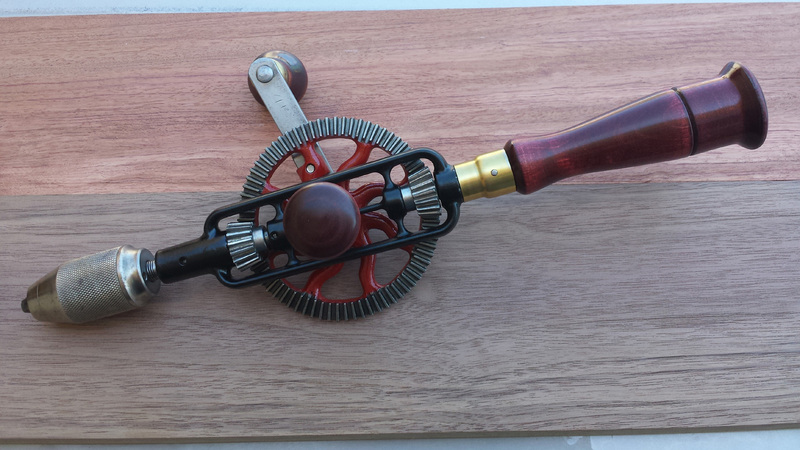 All the wood parts were sanded to about 400 or 600 grit and stained with a mahogany / brown mix. I finished it with a water based poly and paste wax. 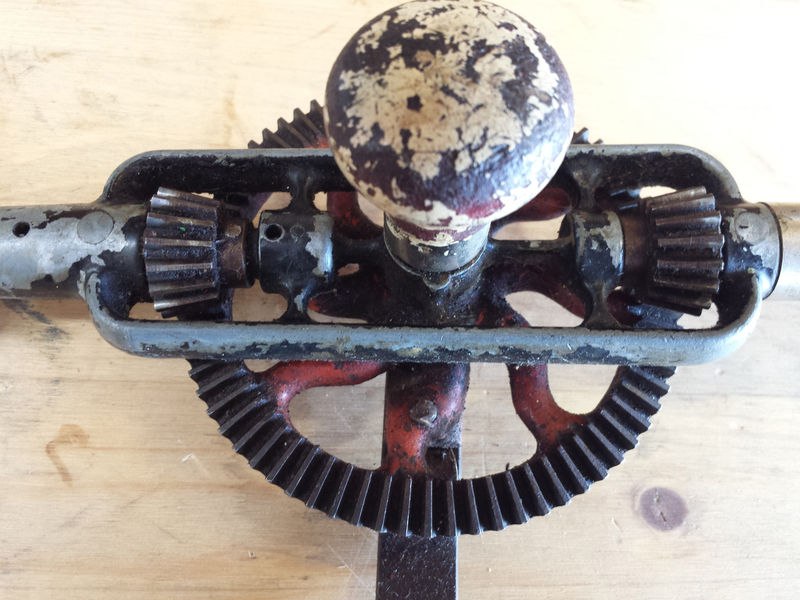 The same treatment was applied to the handle and the crank knob. 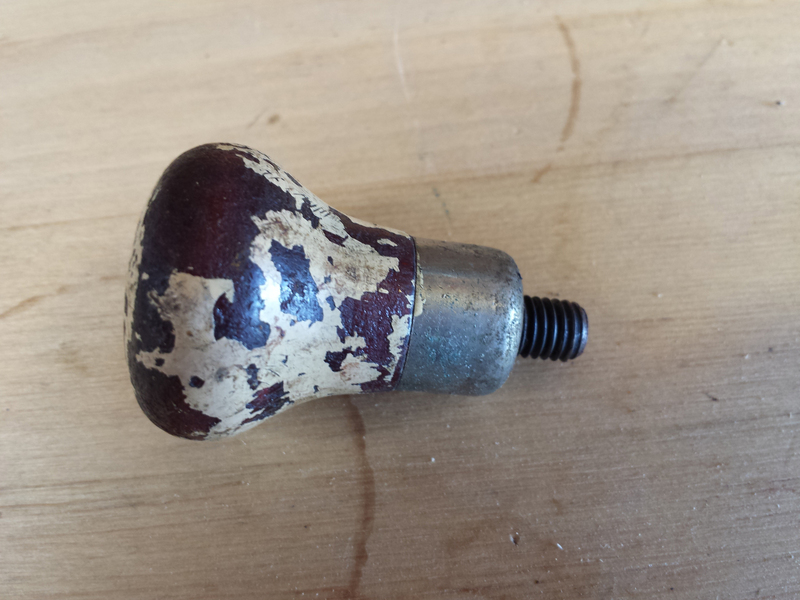 I chucked the ferrule into a drill using some washers and nuts on a through bolt, then polished it out. The brass showed through immediately. I missed taking some photos of painting the frame and sanding the wood parts (my hands were full). 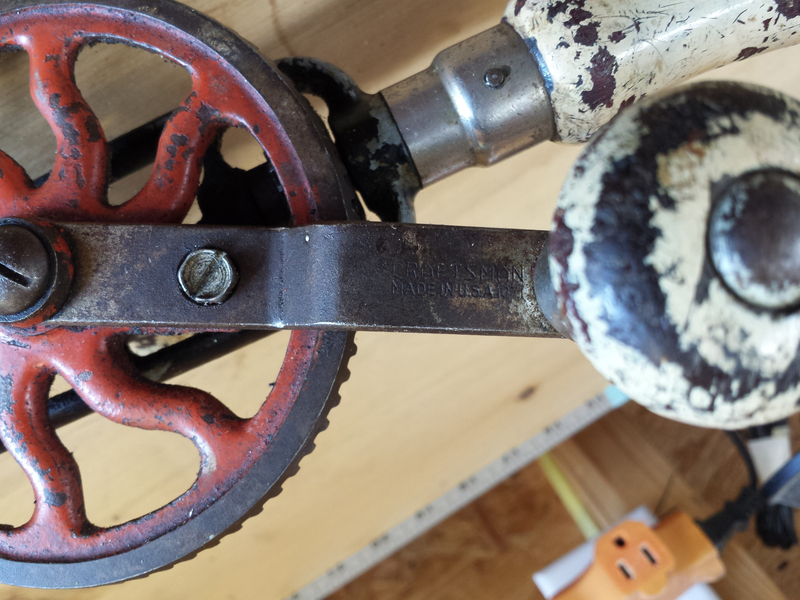 The chuck was wire-wheeled on the bench grinder. I’ll take better photos on future restorations. 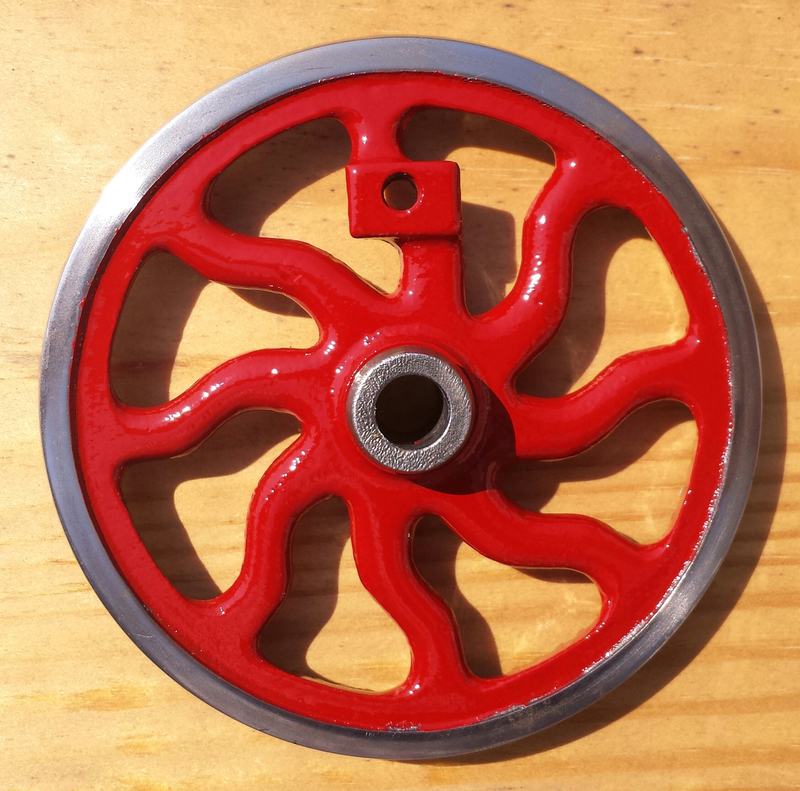 I painted the parts with Dupli-Color Engine Enamel with ceramic: Gloss Black (DE1613) and Red (DE1653). I would recommend the Semi-gloss black instead of gloss black for folks doing their own restorations. Side knob reinstalled and some details of the back of the drill. Do you see the two oiling holes in the frame? One is near the chuck and the other is between the lower gear and the side knob. Front of the drill with everything reassembled. 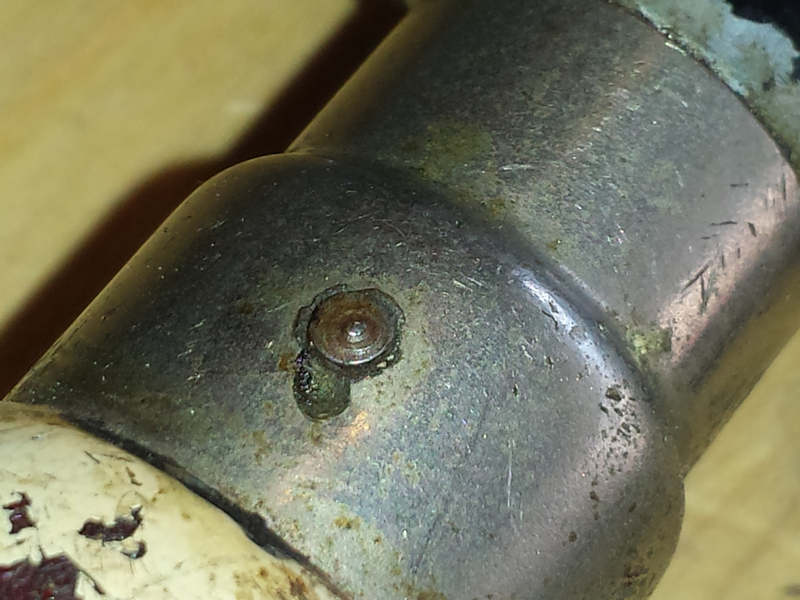 I replaced the inappropriate fastener with an oval-head slotted stainless machine screw. Actually, I thought I’d threaded this one (a #10-32) in, but I later realized it was still too small. I’m going to try and #12 screw before I resort to locating an original screw. 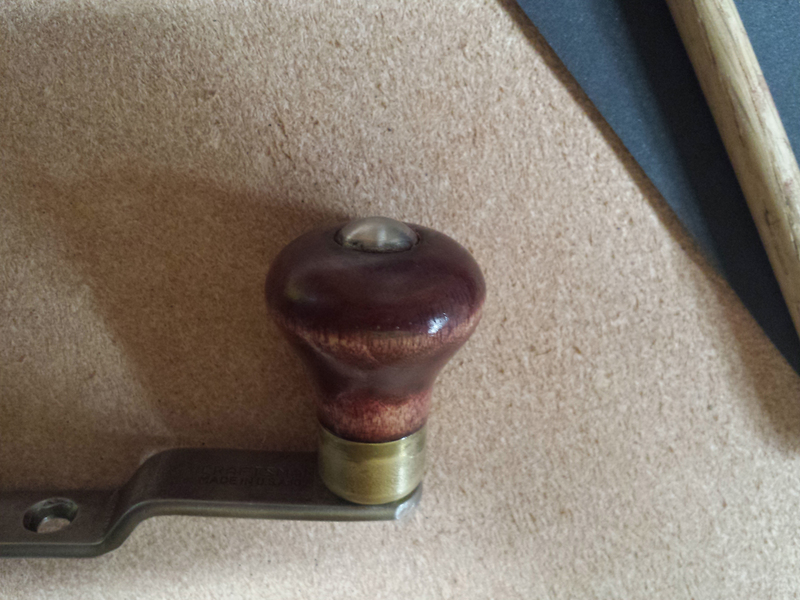 Handle reassembled. I unknowingly raised a burr on the pin when I tapped it back in, and when I brushed my thumb over the pin to see if it was flush, I sliced the craaap out of it. Seriously, I almost needed stitches and I ended up gluing my finger back together over and over for about a week. 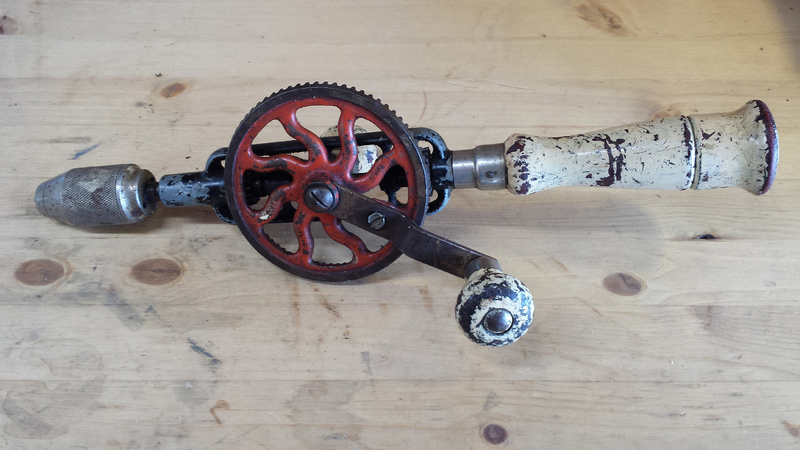 Crank handle, cleaned and waxed. Front of the restored drill. This drill is now ready for another 75 years of service. 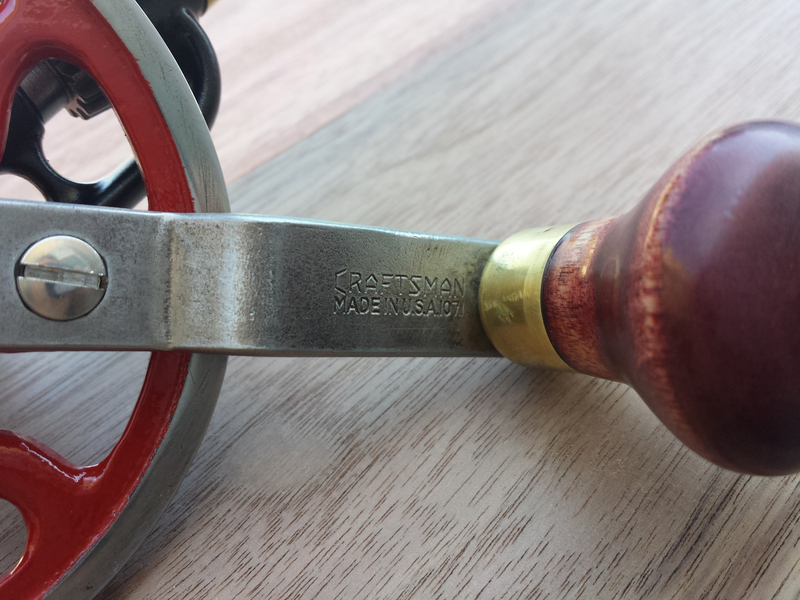 Oh, if you want more Craftsman 107.1 hand drill action, check out another restoration over on Bench Blog. You can read more about the MF 2A at the excellent site Old Tool Heaven. Absolutely superb! Jaw dropping. This is when respect meets skill to make something better than the original. 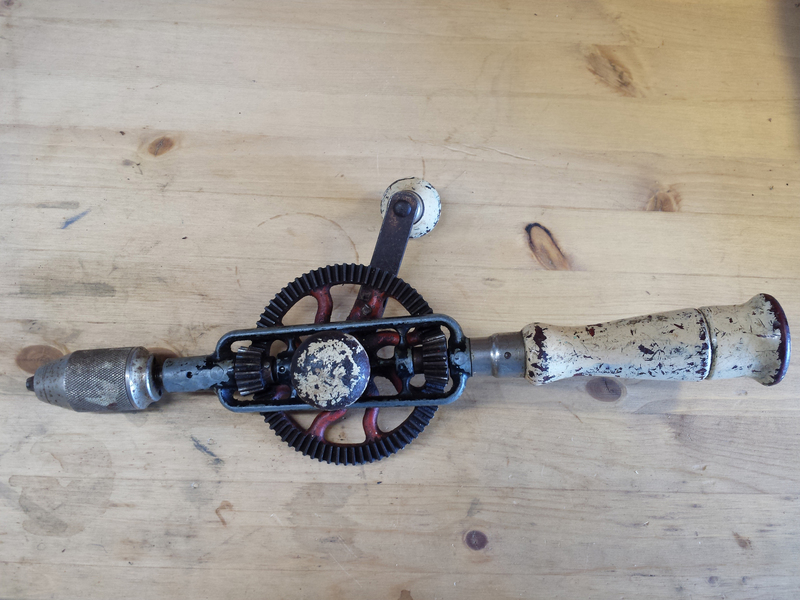 I remember both my grandfather as well as my own father (both cabinet makers) using these hand drills. 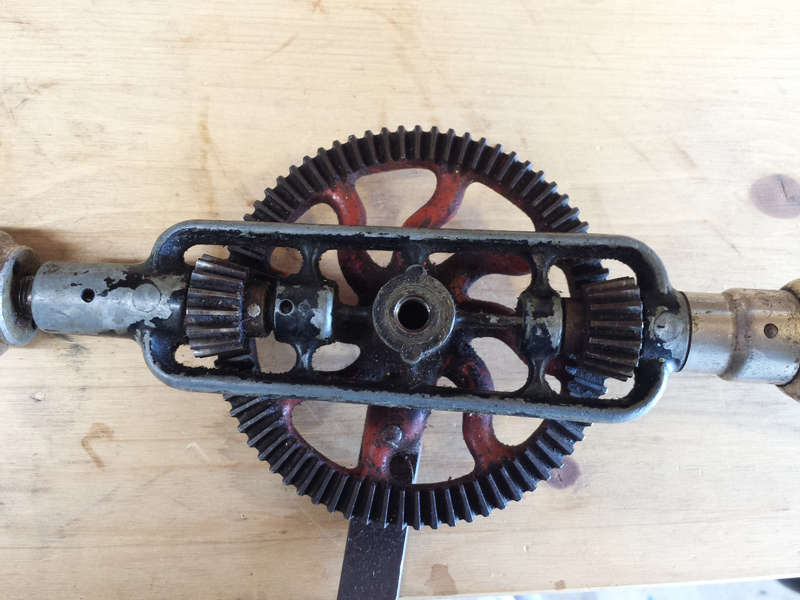 I was fascinated as a kid to watch the two gear wheels turning in contrary motion to each other against the bigger drive wheel that holds the crank arm. Just wondered how do you remove the pins that holds the gears in? Are they easy to replace or do you usually put the same ones back in? Thank you so much for your generous tip! I was happy to hear that my blog has helped you out. Regarding the pins, I gently tapped them out with a simple pin punch that was just slightly smaller than the pin’s head. 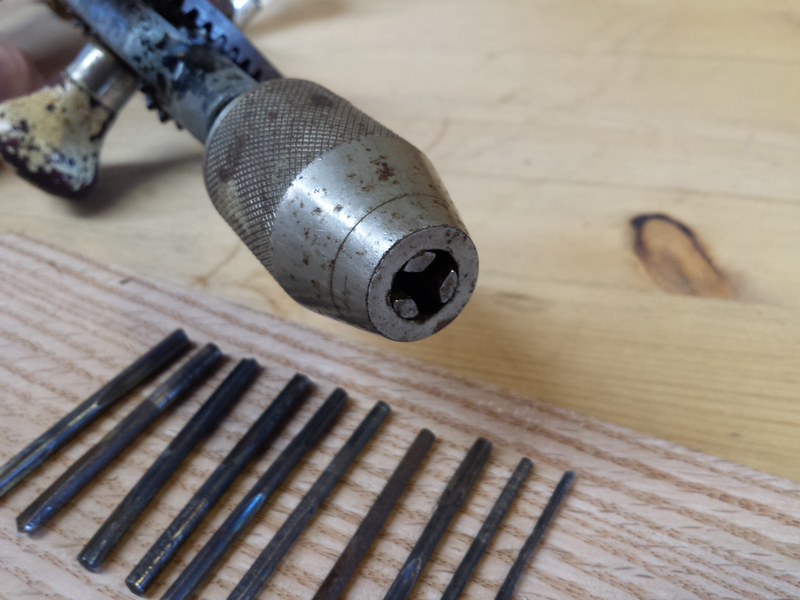 The thing you want to watch out for is if the pin is mushroomed (essentially, riveted) in place, in which case, you might not be able to get it out. 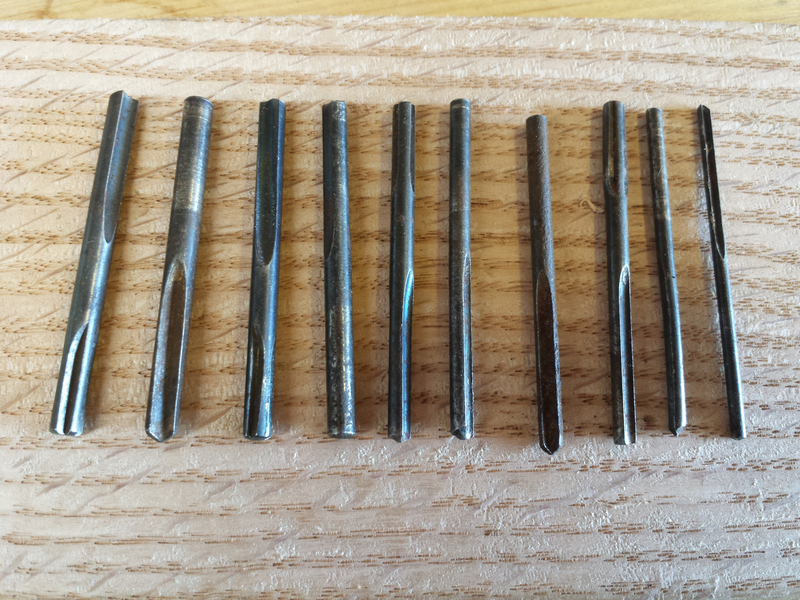 On some drills, the pins were reusable. On others, I found that they were bent or otherwise damaged during removal, so I carefully measured the diameter and located some brass rod that fit. To replace, just tap them gently back in. You might have to wiggle things to get the pin to go in smoothly – don’t blow out the back of the hole forcing the pin in. Sometimes, the pin can be a smidge loose in the hole, and you can either carefully drill the hole to just a beesdik under the next size rod, or else maybe just try a little drop of superglue to hold it from falling out. Let me also mention that once, I tapped in a pin and thoughtlessly ran my thumb over the hole to see if it was flush. The hole had a burr that I hadn’t noticed, and just running my thumb over it sliced me right through. I mean, I was bleeding all over the place! Such a tiny thing – you don’t think about it, but file it in the back of your mind for later. Thanks again for visiting and for your kind donation! Thanks very much for the detailed reply. 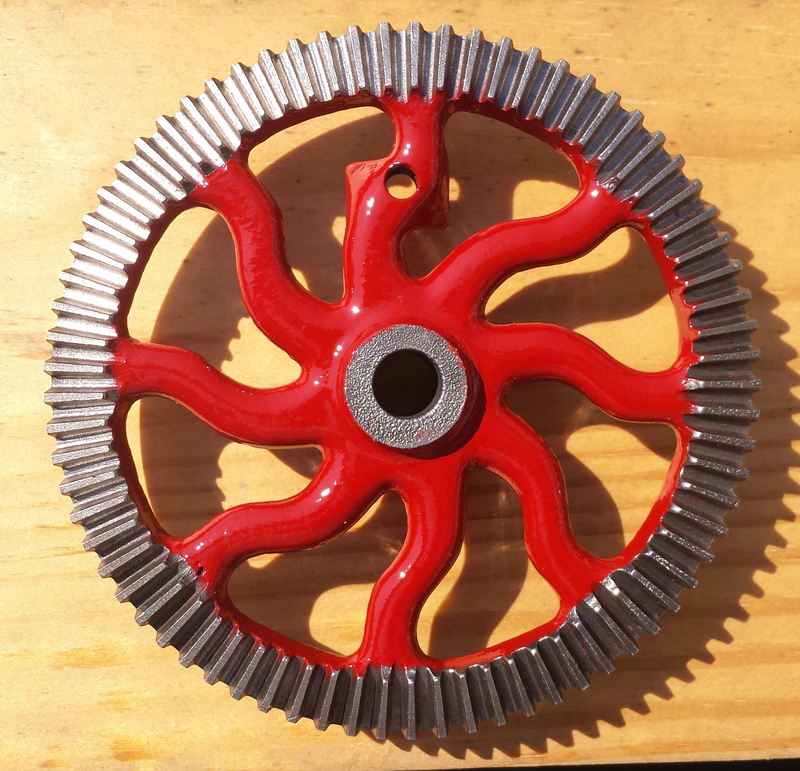 Im in the UK so dont get hold of many of the better quality stuff like you have but just working on cleaning up a Fabrex, Stanley and a Footprint, but i have got a Mohawk coming (which has the stylish drive wheel like on your models) i managed to get pretty cheap. Not to the quality finish you do mind but i think you said somewhere that its not the hardest restoration job but very satisfying results which i find to be the case.